Budwig Collapsible Tilt Stand set consists of four low-profile molded feet and steel tilt stand. The tilt stand snaps into the upright position, and when not in use, the tilt stand folds flat against cabinet base for transportation, storage or stacking. Skid resistant rear rubber feet help keep instrument in place without marking surface. 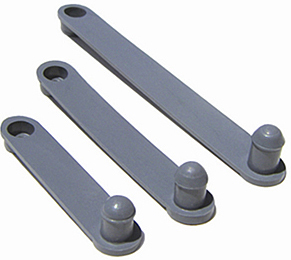 Budwig Cable Straps are designed as a quick and efficient method for attaching small wire bundles, cable, tubing, etc. to sheet metal. Simply snap the ring end in to specified diameter hole, position wiring, fold strap over and lock in place. 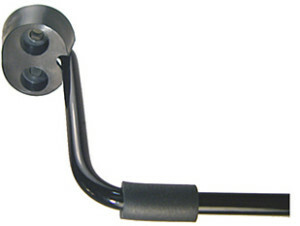 The Budwig Antenna Connector and Insulator are for use by ham radio operators and others in fabricating an inexpensive and efficient dipole antenna. Designed for durability and light weight, the HQ-1 Connector provides a coax SO-239 socket for accepting a PL-259 feed line plug. The one piece molded body offers weather tight construction and provides a drip shield to protect the coax fittings. Full legal power capacity. The Budwig HQ-2 Antenna Insulator is designed for use with Budwig HQ-1 Connector when constructing a dipole antenna assembly. Deep ribbed construction provides increased surface path to reduce power leakage. Light weight and durable.